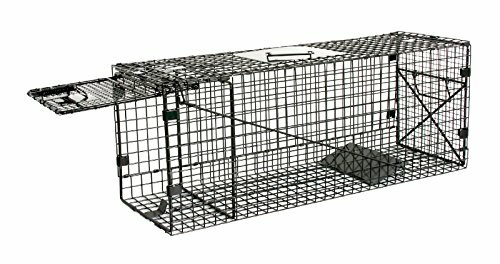 Humane Way 914048 Live Trap Animal, Medium 32"x12"x10"
Humane way live animal traps are Proven to provide a safe, non-lethal alternative to general yd & garden destructive rodents & animals. The design of our animal traps ensure an easy assembly, a secure environment for captured animals, & a simple removal process when ready. Whether you are dealing with coyotes, stray dogs, raccoons, Possum or Foxes, the humane way live trap is perfect for a simple, no-kill solution. The easy up design of this trap provides a simple, straightforward method making it applicable to both amateurs & professionals alike. The trap will go from flat to assembled in S, with no tools necessary. It is extremely compact for easy storage, & designed with a simple gravity action locking door mechanism to ensure a safe & secure capture. All easy up traps are galvanized, black powder coated, & enhanced with anti-glare material for long life, camouflage, & the prevention of rust. Looking for an easy solution to garden pests? look no further. Humane way animal traps provide an excellent, well built product that will satisfy all of your trapping needs. If you have any questions about this product by Humaneway, contact us by completing and submitting the form below. If you are looking for a specif part number, please include it with your message.